“Everything You Know is Wrong”, “Weird Al” Yankovic’s loving tribute to They Might Be Giants, is one of those songs where Al gets everything right. I like it so much that it’s not just one of my favorite “Weird Al” Yankovic songs. In a weird sort of way, it’s one of my favorite They Might Be Giants songs as well, in the same sense that my brain thinks of “Dare To Be Stupid” both as a “Weird Al” Yankovic song and a Devo song someone other than Devo just happened to have written and recorded. “Weird Al” Yankovic and They Might Be Giants are, of course, towering colossuses of the comedy music world. “Weird Al” Yankovic and They Might Be Giants have each occupied valuable real estate in the fertile, suggestible minds of multiple generations of young geeks, for whom they aren’t just favorite musicians but personal heroes. Like David Bowie and The Talking Heads for weird kids a little later in their development, “Weird Al” Yankovic and They Might Be Giants serve as guides through the uncertain currents of childhood and adolescence who let misfits and kooks and outcasts know that it is perfectly alright to be, well, weird. In fact, it’s actually far superior to the alternative. I went through a They Might Be Giants phase and when I worked for The A.V. Club, and visiting minstrels would bow down to kiss the ring of our collective power whenever they were in town, I missed the opportunity to be part of a group of The Onion staffers performing back-up vocals for their cover of Chumbwumba’s “Tubthumping” for a video series filmed in the office. Later that cover made one of They Might Be Giants’ b-sides and obscurities collections, so I missed out on an opportunity to sing back-up on a They Might Be Giants officially released track. Don’t weep too much for me, dear reader, as I got to sing onstage “Tubthumping” and “Horse With No Name” with They Might Be Giants and a whole bunch of my former colleagues in the Vic theater in Chicago, where Al will actually be performing this April during his upcoming tour. Incidentally, Chumbawumba has also recorded a song called “Everything You Know Is Wrong.” Does that mean anything? No, it does not. Just some weird coincidences. I have unusually deep connections to “Weird Al” Yankovic and They Might Be Giants but they are towering figures in the imaginations of growing geeks everywhere. “Everything You Know Is Wrong”, like “Dare To Be Stupid” is the perfect amalgamation of Al and his inspiration. It’s like the movie The Fly and Al and They Might Be Giants’ DNA got all mixed up, only instead of it resulting in a horrifying fly monster that spits acid and is utterly repellent, one of the most beautifully constructed and just plain perfect songs in Al’s discography ensued. Channeling the spirit of They Might Be Giants liberated Al from the prison of rhyming. Instead of being limited to rhyming couplets, words spill out here in a rapid-fire stream-of-consciousness ramble in verses that start out gleefully absurd (the singer begins the song driving down the freeway but with a rabid wolverine in his underwear) and then get more violent and demented before a mysterious figure (alternately, a prosthetic-lipped Hibachi dealer, the floating disembodied head of Colonel Sanders and Saint Peter) up-ends their already fractured sense of reality with the titular burst of hard truth. Ah, but this is a particularly silly “Weird Al” Yankovic song so death isn’t anything near an end. He ends up having a complicated relationship with Saint Peter, who does not care for his Nehru jacket (it’s strongly implied that it violates heaven’s dress code) so he lets him stay in paradise, but next to an ice machine, and every day screams out the titular warning. Colonel Sanders, or more specifically, the floating disembodied head of Colonel Sanders, is a quintessentially Al reference to drop, as Sanders had the curious distinction of being at once a real human being and businessman who ran Kentucky Fried Chicken and a sort of living television and print commercial. 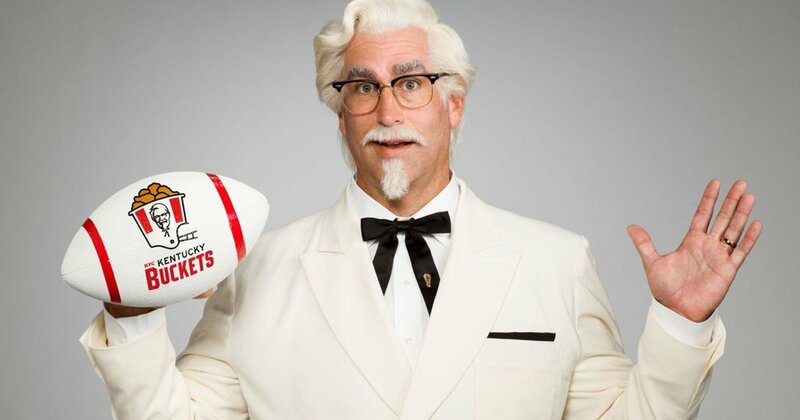 Colonel Sanders was a real dude but at a certain point he became a more or less fictional mascot and TV pitchman. It’s a testament to how casually surreal television advertising has become that, for reasons known only to Kentucky Fried Chicken, they’ve decided to have a never-ending string of actors and comedians cycle rapidly through the role like some weird, fried chicken-themed version of Todd Solondz’s Palindromes. 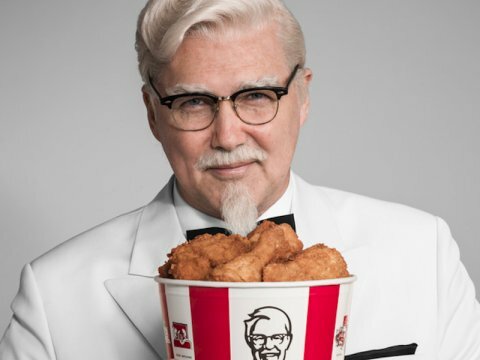 Over the last two years, Colonel Sanders has been alternately portrayed by Darrell Hammond, Norm Macdonald, Jim Gaffigan, George Hamilton, Rob Riggle, Billy Zane and Rob Lowe. That is insane, and nobody has made a big deal about it. Granted, it’s not quite as unusual as going to the kitchen for some Golden Grahams and being sucked into an alternate dimension where you travel through time and encounter the floating, disembodied head of Colonel Sanders, but it is pretty strange when you think about. Like the Oingo Boingo pastiche “You Make Me”, there’s something vaguely Seussian about the way the music moves here, a sense that it might be the product of some stop-motion animated Rube Goldberg machine or careening musical rollercoaster. Al captures the Technicolor absurdity and quirkiness of the They Might Be Giants aesthetic perfectly here, as well as the runaway sense of momentum that characterizes their most infectious songs. Like “Dare to Be Stupid”, “Everything You Know Is Wrong” is aggressively nonsensical and undeniably anthemic. It’s the perfect fusion of Al and the two Johns. It underlines how much these two acts have in common, while also establishing what makes them unique and also national treasures.